How to share my smart exam with my friends? How to add new questions? 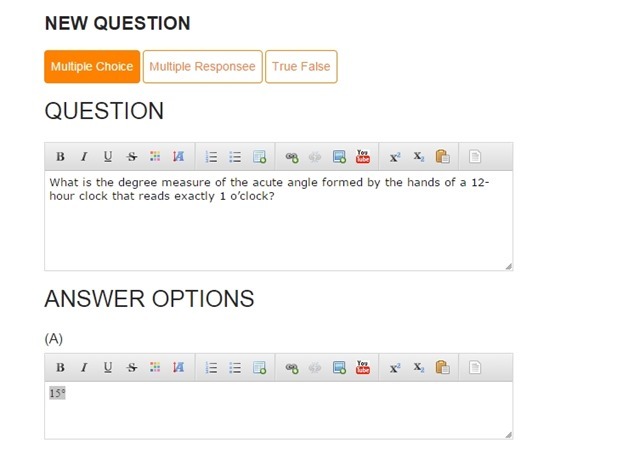 Add new question with OnlineExamMaker is very easy, first login in to your account, and then click the questions menu at the left side of the page, after you opened the questions manager page, click the New Question button at the top right corner of the page to start to add a new question. The first blank field is question content, in this field, you should write the question title here. For example, the above was a math question. 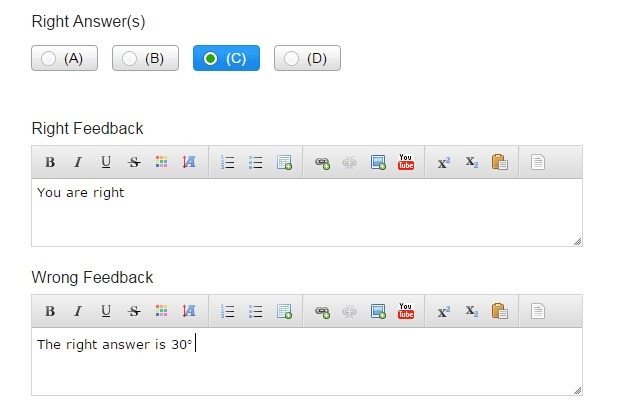 After the answer options list for options from A to D. You should fill in these options with real data. All option field and the title field are fulfilled editors, you can change font color, font size, add list, grid, link, video and images. You can past image URL in the URL input box, or click the Upload Image button to upload a image. In this question, the right answer is C, so the C of the Right answer field have been marked blue by click on it. Fill in the right & wrong feedback blank, for the right feedback blank, the message will be showed at the summary page of the exam if the question have been done right, or the wrong feedback message will be shown. 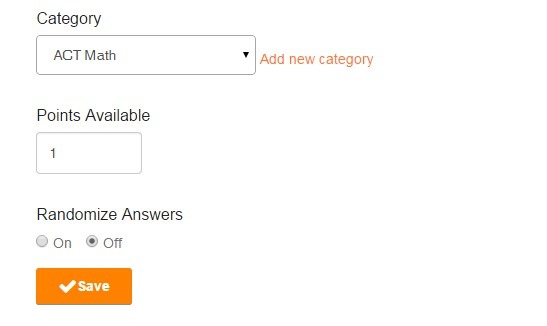 You can now select a category for this question or click the Add new category link to add a new category for this question. Set the points the students will got if he or she have done the question right, the default is 1 points. If you want to make the question options display in random orders, please check the on. In the end, click the save button to save the question, and then, the question have been successfully created. You can find it in the questions manager page. You can continually add question to the bank one after another. How to add image to my question? How to brand my exams? How to create my own online exam? How to let students or employees register to my group?